National Instruments understands that you may not have the time or resources to participate in an instructor-led training program. 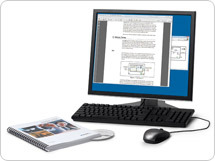 To accommodate your unique needs, NI printed course manuals, often referred to as course kits, feature hard copies of the course concepts and exercise manuals and the software exercises and solutions used in hands-on courses. Whether replacing manuals from a previous course or reviewing the course materials for the first time at home at your own pace, you can use these printed course manuals as an excellent reference for quick refreshers of technical topics or preparation for an upcoming certification exam. Buy training credits now and use them later for any training and certification offerings.